SandBar is our free online quarterly publication that brings awareness to coastal problems and issues. 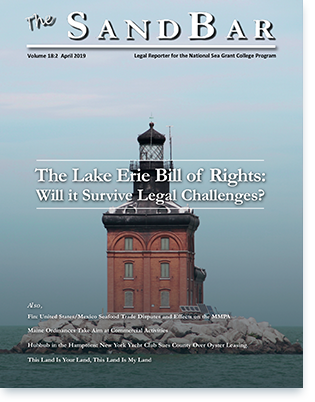 Law Center attorneys contribute to the field of ocean and coastal law and policy through the analysis of current issues and the publication of their research results. Center attorneys participate in continuing education programs, conferences, and symposia which serve to educate policy makers, practitioners and laypersons on issues of marine resources policy issues. Attorneys also train law students in the field of ocean and coastal law. The staff of the National Sea Grant Law Center respond to research requests from the legal community, Sea Grant College Programs, and state and federal agencies located across the country. The Ocean & Coastal Case Alert is a monthly newsletter highlighting recent court decisions impacting ocean and coastal resource management.